Wii Music is an extremely creative, yet underrated, game for the Nintendo Wii. You are either the maestro or a member of the orchestra, and play along with the music using a combination of movements and button presses. While a great game, it is difficult to imagine that you are playing a violin holding a couple of video game controllers. For this reason, many Nintendo Wii accessories have been created that mock the shape of real musical instruments. There are a lot of choices, so I want to share with you some of the best that are around. The best deal, and most popular, Wii Music accessory is the 15 in 1 Music Pack by CTA. There are over 60 instruments in the game, and this bundle comes the closest to covering all of the bases. The instruments included are a violin with bow, a castanet, a pair of drum sticks, a dog paw (so much fun! ), a horn, a trumpet, a sax, and a bell. You can make a lot of music with this set, and it will only set you back around thirty bucks for everything. Everything is made from a hard foam that is soft enough that they don’t put a whole in your flat screen if they slip from a hand. There are small pieces in this kit, so it is not recommended for homes with small children. For a more realistic feel, check out the Wii Music Orchestra from DreamGear. Instead of being the hard foam that the CTA instruments are, these are plastic and colored the appropriate color. In this kit you get the maestro’s baton, a violin/cello, a trumpet, a clarinet, a set of drumsticks, and a flute. It is less pieces for a bit more money, but the increased feel of playing actual instruments is well worth it. The pieces in this kit is larger than the CTA ones as well, which makes them much more appropriate for homes with younger kids. 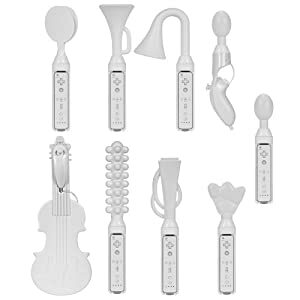 Buying the Wii Music accessories help you feel like you are right there in the pit with the rest of the band. Each of the bundles discussed above have enough pieces so you can invite over all of your friends for a jam session. Wii Music really comes to life when there are actual instruments involved, it makes the gameplay much more realistic and adds a whole new element to the entire game!